In this day and age, information flows easily and freely via channels that used to not exist. The internet connects various outlets into one source for information in ways that only textbooks were able to match 15 years ago. The internet and its associated information sharing are a great boon to this hobby. But also a real concern. We all gather information and store it away for later use in our brains. We develop a base of knowledge on which we draw conclusions and to which we constantly add new or improved information. This flow of information can be represented in a fashion just like the ‘food pyramid’ of grade school memory. The base of the pyramid is made up of everything we’ve come to understand and all of the facts we’ve stored away. As you move toward the pinnacle of the pyramid, you get into fuzzy realms where opinion and theory press beyond what we understand as fact. The base, or lowest layer, of our knowledge should be formed by the most trusted sources. Textbooks and referenced research articles make up the vast bulk of information for filling in the foundations of our understanding. As time progresses, the information we gain from less reliable sources, but come to accept also filters downward into the base of our understanding. Keep that in mind as you build your library. Without proper references, what you are reading is likely someone else’s opinion. 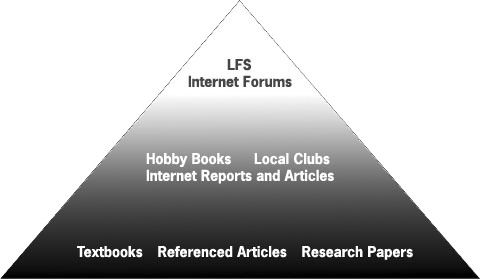 The middle layer contains current topic items that are passed around by local clubs, internet reports and articles, and hobbyist level books as well as books and articles that present practical experience, but don’t reference much of their information. Talking with that buddy of yours from the local club and learning how she kept her inhabitants alive, for example. They are still valuable sources of information, but they do not stand alone. The top tier is comprised of forums, gossip, and, unfortunately, many local fish store’s advice. Its not the fault of the store owners, per se, but the hobby moves at a constant pace, and many stores provide outdated information to their customers. This is certainly not true of all stores, but keep it in mind that you might want to double check your background knowledge against more standardized sources. Internet forums are the last place that I would consider searching for information. It is true that there are useful tidbits buried amongst the millions of postings, but frequently there is zero validation of that information. Many people parrot responses they have seen others post, post their own opinions as fact, and generally don’t put much thought or time into full in-depth answers to posed questions. Take answers given via forums with a thousand grains of salt. All of these information sources flow downhill in that hypothetical pyramid of knowledge. As you spend time in the hobby, you amass a great deal of information. But as with the LFS mentioned above, the hobby continues to move. Do you? At Advanced Aquarist, we strive to provide you with solid scientific and hobby level articles that demonstrate and provide a depth of knowledge you can trust.